How are you 2 months old already?? 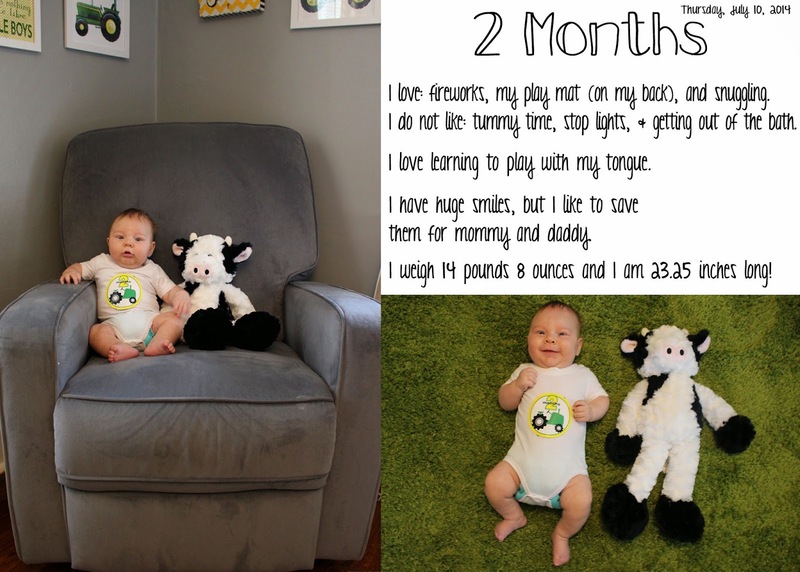 We cannot believe you have only been here 2 months because you are the most important thing in our lives. 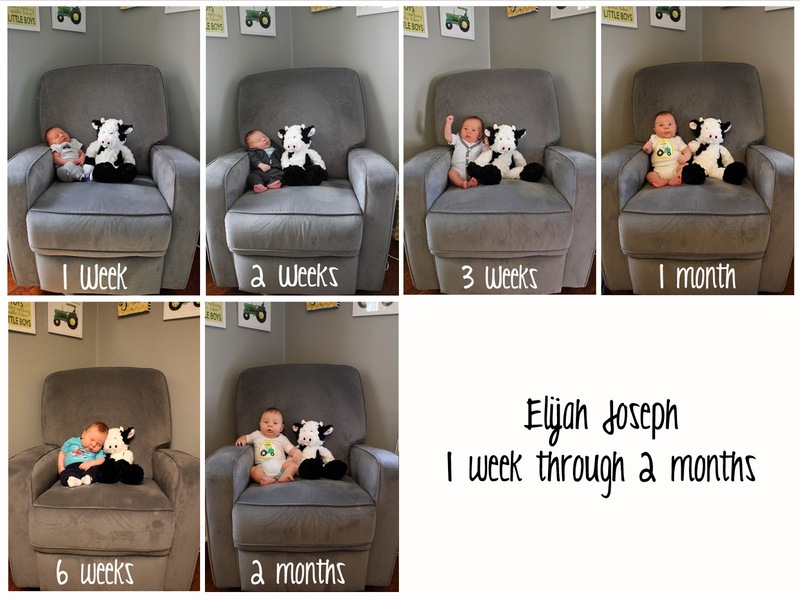 But at the same time we can't believe how fast these 2 months have flown by! We are so amazed by you every day. I still haven't slowed down with the number of kisses I love to give you. Speaking of that, I need to go give you a kiss right now! Your daddy is always amazed by how smart and how strong you are. We just need to get you to like tummy time so you can be even stronger! We left you for the first time today without one of us to go out for our anniversary. It was very hard and we talked about you a lot. We knew Grammy and Grandpa would take great care of you, but it was still not easy (especially for me). What if you were crying and you only wanted me?! I didn't want you to worry that I wasn't coming back. But that didn't happen. You enjoyed your time with them and they even both wore you! We only went to dinner and came right home. But it felt too long! You faces crack us up all the time. I love to take lots of pictures of you on my phone. I can't imagine if I didn't have my phone there at all times to catch your hilarious facial expressions! I love to look back through my pictures and look at your adorable faces. I am getting very sad as there is only one month left in summer. I do not like thinking about leaving you when I go back to work. I want to always be there for you whenever you need me! We are looking forward to another fun month of growing and learning! Clothes: Daddy started putting you in 3-6 month jammies some nights (I just think you wearing jammies is the most adorable ever) and I don't like it! But they do fit better. You are still wearing 0-3 clothes, but I should probably move to the 3-6. I don't wanna do it! It also makes me sad that so many of your 0-3 clothes you only wore once! Diapers: We have moved up to mostly one size cloth diapers in the last few days. I didn't want to give up the NB, but we have had too many leaks. I don't like how big they are! In disposables (rarely) you are still in size 2. Cloth laundry is still going well. Now we have a plethora to choose from! Since you rash has been gone, we only put coconut oil on your bum and it looks totally clear all the time! Coconut oil is magical! Sleep: You will sleep for hours when we wear you (Daddy loves to wear you too!). Going to bed for the night is always a process because you wake yourself up and then get all upset. We set up the video monitor a few weeks ago. We have tried a few times to put you down and then watch a show downstairs. Usually it involves several trips back upstairs when you are upset! We have started to try a kind of bedtime routine involving eating, diaper, pjs, story and song,rock and then swaddle and rock/walk until you fall asleep for good. Bath is after eating if it is a bath night (about 3 times a week). The routine is a VERY loose one. You wake about 1-2 times a night and then thenext time (7ish) I will usually bring you into bed with me if you don't want to go back to sleep in your bed. It is going to be ROUGH going back to work. You are still a very sleepy boy and sleep most of the day. Though you are starting to have a few 4 hour stretches in the last few days! I try for the whole eat/play/sleep routine...but usually you prefer eat/sleep! We are also started to try crib naps. At first you would need your paci put back in every 15 minutes, but now you have slept a few times for 45 minutes to an hour. You like to fight sleep a lot. And when you are doing that as you are falling asleep, you pick up your head and slam it down on our shoulders or face. Ow! Why do you do that?! And you snuffle around on our shoulders. Until you finally conk out. We have to trick you with the swaddle because when you are too awake all you want to do is FIGHT TO GET YOUR ARMS OUT! But if we don't swaddle you, you wake up every 10 minutes when you startle yourself. Eating: In preparation for going back to work, we have tried to have daddy give you a bottle a couple times a week. You aren't really happy about it, but you will take it. You took one from Grandma last week pretty well. I usually have a hard time and have to go pump somewhere far away so I don't hear your sad cry. I wish you never needed a bottle! During the day you eat on demand. I continue to try to do about every 2 hours if possible to get in as many feedings during the day as we can. I just love that I am able to give you all you need to get strong and grow. And the cuddles are super awesome. Dislikes: Getting out of the tub, stop lights, being tired, tummy time for more than 5 minutes (You are pretty good at pushing up when you want to! ), and being swaddled arms in. Oh! And this: When you are getting ready to start eating, I sign "milk". Also, we sign "more" and "all done" when we are playing with you and talking to you. One time you looked right at me and signed "milk" (not at eating time). I am sure it was a fluke....or you are a genius. New Tricks: I am probably making this up, but many times when I am kissing you on your cheeks, you open your mouth wide and I put you near my cheek and tell you, "Thank you for the kisses!" You have also discovered controlling your tongue and love to stick it out. I like to stick my tongue back out at your and then you will do it again! You are learning and exploring! We took a walk to the park. Elijah slept and Mommy read. Big smiles in the morning! Hanging with friends at the park. The three of us climbed to the top of the silo! Sleep when the baby sleeps is a myth!